Supporting sexual assault survivors one tote at a time. The hours following a sexual assault can feel full of humiliation and shame. The survivor arrives at an emergency room, or a women’s advocacy center, to receive medical care and a sexual assault nurse examination. This examination includes the collection of evidence for law enforcement. The clothes worn during the assault are considered part of this evidence. When leaving the facility, it is common for survivors to be given paper clothing to wear. We want to help restore the layers of dignity lost. Now you know. now you can help. We believe that sexual assault survivors deserve, not only clothing for leaving the hospital, but a picture of the hope and redemption that is possible. 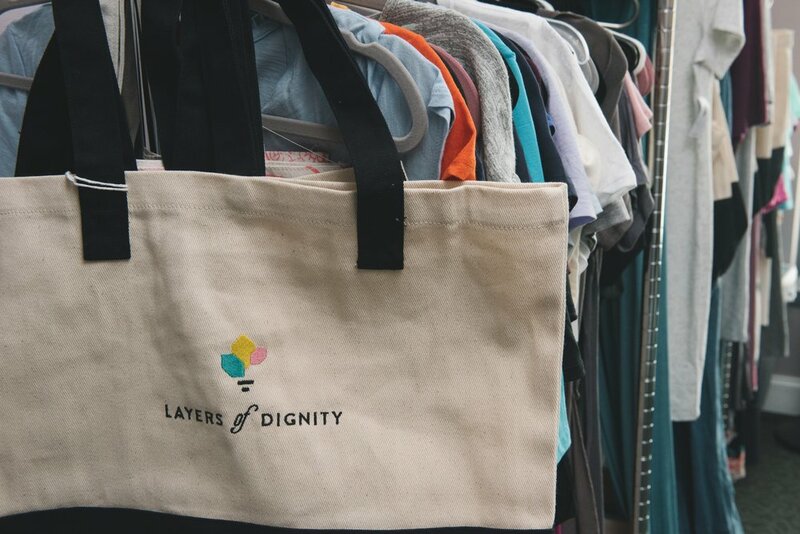 Layers of Dignity does this by providing tote bags to emergency rooms and women's advocacy centers. These totes are to be given immediately after the evidence collection. Instead of leaving in paper clothing, sexual assault survivors will take those brave steps in brand-new clothes. They will be armed with resources and aware of the community that stands with them from a love note handwritten by a fellow survivor. Survivors have a long road ahead of them. Through Layers of Dignity, let's show them they're not alone. We exist to provide the first step towards healing and restoration. Sexual assault is unfortunately a frequent occurrence. Every 98 seconds someone in the U.S. experiences an assault. Most victims are young females who will likely experience effects of the assault for years. Providing a tote and resources for emotional support is an immediate step towards healing. women will experience a sexual assault or attempted assault in their lifetime. of women will experience symptoms of PTSD (Post-traumatic Stress Disorder) during the two weeks after an assault. of sexual assault victims are between the ages 18-34.
sexual assault survivors are male. We plan to come alongside men as well as our financial support and donations grow.